Ginny and Hermione didn&apos;t have same classes all day. When Hermione had potions, Ginny had Transfiguration. Hermione couldn&apos;t wait til she had potions. She really liked it. But it was hard sometimes, and Slughorn always knew what to give as a challenge.
" Ms Granger?" Slughorn said when the whole class stood together, including Draco Malfoy. He and Theodore Nott had potions as well this hour.
" Yes sir?" Everyone could hear Hermione&apos;s excitment in her voice.
" Could you please tell us about this potion?" Hermione nodded and stepped forwards. Theo nudged Draco with his elbow, but he didn&apos;t response.
" This potion is called Amortentia. 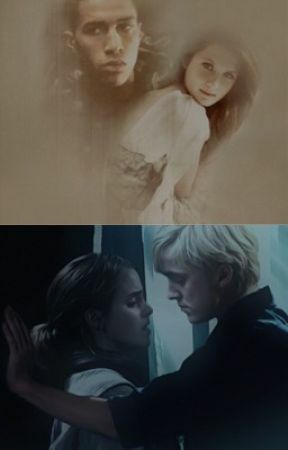 It&apos;s the most powerful love potion in the world" For the first time in that lesson, Draco looked up from where he stood. Now everything got more interesting, especially when she mentioned the you-can-feel-the-smell-that-attracts-you-the-most thing. He couldn&apos;t wait until he could put down his nose in the cauldron and feel Hermione&apos;s scent.
" That was perfect ms Granger! 15 points to Gryffindor" Draco could see the shade of pink on the Gryffindorprincess&apos;s face. He thought it was quite cute.
" Now, I will pair you up. 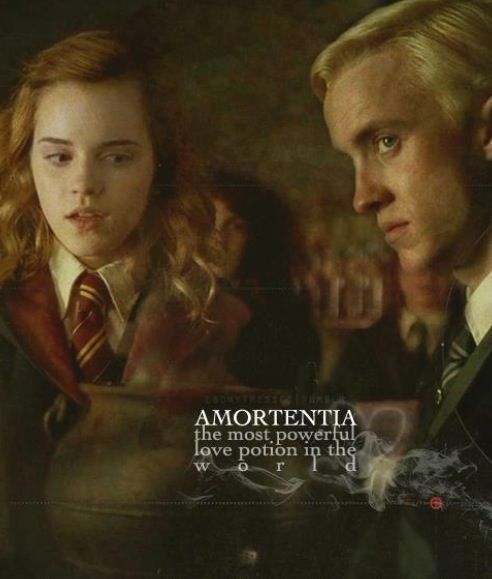 And you will do the Amortentia potion before you leave this classroom"
Before Hermione could either think or say anything she was paired with Malfoy.
" Looks like you&apos;re stuck with me eh, Granger? Don&apos;t worry you will enjoy every minute of it" Hermione looked like she could throw up any second, but she couldn&apos;t stop blushing.
" Hey, you&apos;re blushing!" He gave himself a mental headslap when he heard himself say that. What was he thinking?!
" Hey, you&apos;re still a ferret!" Hermione said with a huge grinn. Draco could hear both Seamus and Dean laugh their heads off a few meters away.
" Shall we start then?" Draco said and tried to change the subject.
" Sure" Hermione said shortly when she noticed the fun hour was over. She quickly fixed the ingredients and Draco read what the book told  them to do. Hermione immediately started, she wanted to get out of there as soon as possible. They held everything in the boiling cauldron and waited.
" When is it done?" Draco wondered. " In ten minutes. Why?" Hermione sighed. Suddenly Draco walked closer to her.
" Just so I know how long time I have with you" Hermione tried to back away, but the desk was already in her back. " Malfoy.....?" " Yes love?" Without thinking, her knee flew up in Draco&apos;s lower parts and he fell down on the floor.
" Aaaah!" He screamed and everyone turned their heads towards them.
" Ms Granger what is the meaning of this?" Hermione almost had a blackout when she looked down at Malfoy who was still trying to breath normal.
" He....um....burned himself on his hands. From the fire...." Hermione said and looked at the fire that made the potion boil under the cauldron.
" Oh, well. Keep your hands under some cold water for a while mr Malfoy. That should do it" Draco was shooting daggers at Slughorn when he walked away. &apos; Now this will be so much harder than I thought&apos; Draco told himself. A/N I don&apos;t know about you guys, but this was one of the most funniest chapters I&apos;ve ever written xD.